With lower grain prices many row crop farmers are looking for new opportunities to diversify their operation and improve cash flow. Others may be looking for a way to bring the next generation back to the farm. Livestock production, specifically contract pork production is one way to add a layer to the farming operation to accomplish these goals and financing the operation will be a key to reaching that goal. 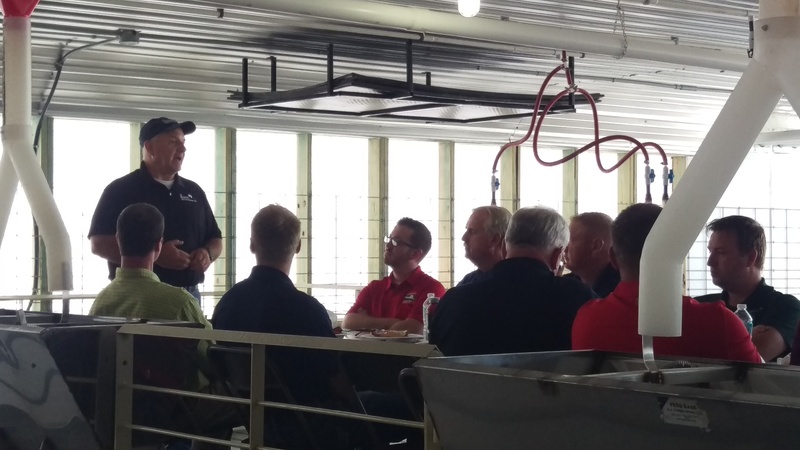 The Nebraska Pork Opportunity provides farmers the chance to build their farming business, grow their family income and profitability and help our state’s agriculture industry reach its full economic potential. The Nebraska Pork Opportunity highlights the interrelated system of crop, livestock and biofuel production capacity that is basically unmatched anywhere else in the nation. Integrating hog finishing into a row crop farming business offers significant benefits. Most of the farms in Nebraska are specialized, producing either row crops or single-species livestock. A farmer can open the door to a promising economic future by integrating these two strong industry segments into a farming business. 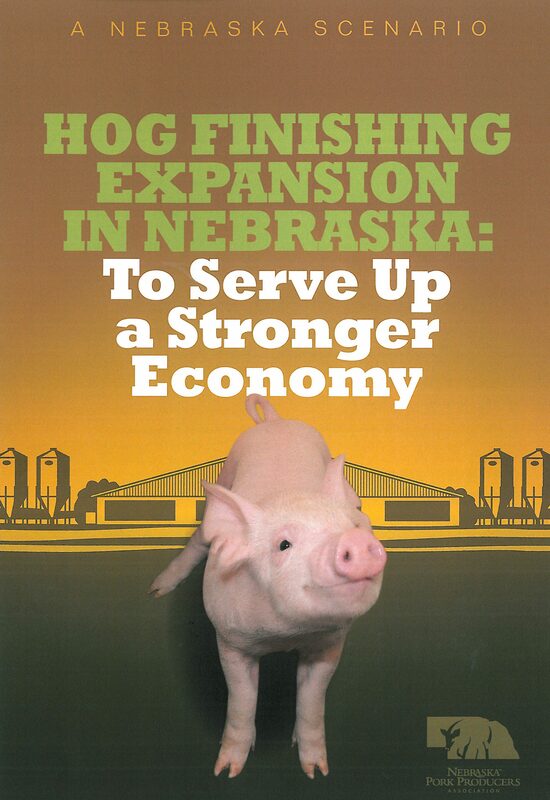 Nebraska is situated to increase the size of the state’s hog finishing capacity. The positive results of this hog finishing expansion include local tax revenue impacts and statewide economic gains. Plus, the value-added activity of expanding hog finishing is key because it shifts the production of commodities, like soybeans, corn and dried distiller grains, to finished agricultural products, like pork, for export out of state. Currently, Nebraska does not feed all of its annual weaned pig crop to market weight levels, shipping about one-third of them out of state to be grown and subsequently shipped back to Nebraska for processing. Over the past decade, Nebraska’s annual pig crop grew by about 14 percent, which was on par with the national average. However, as growth of the U.S. hog industry has focused on the Midwest, largely due to better proximity to feed inputs, neighboring states have taken greater advantage of the opportunity to expand the number of pigs fed. More than 80 percent of Nebraska’s soybean meal output, over 33 percent of the annual corn crop, and more than 50 percent of the in-state production of Dried Distiller Grains is shipped out of the state. The pigs are following the feed inputs out of the borders of Nebraska. Hog production has the potential to play a pivotal role in increasing the utilization of Nebraska’s major crops. Research conducted by the University of Nebraska – Lincoln show expansion of hog finishing in Nebraska by 25 percent would utilize an additional 11.6 million bushels of corn and 4.9 million bushels of soybeans. 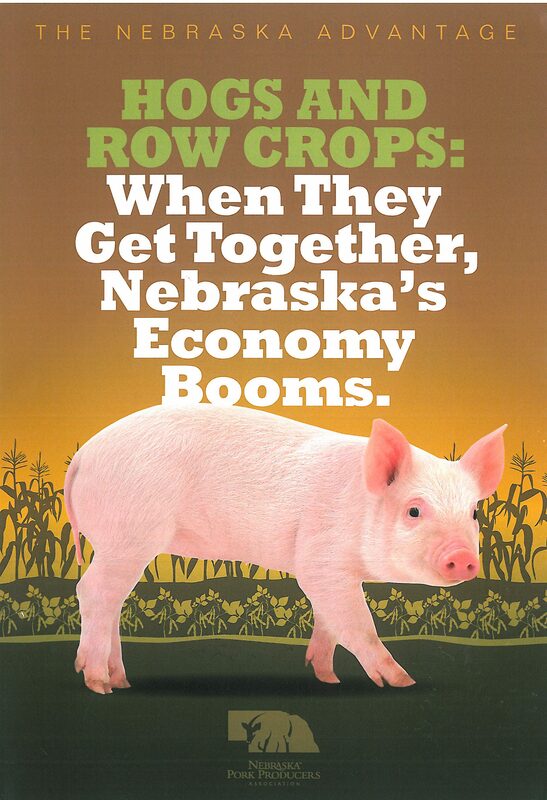 Read more about the opportunities for pork production in Nebraska. One of the biggest rewards a farmer would see from the inclusion of pork production is what is left behind in the process…the manure. The pigs will provide consistent, high quality organic fertilizer substitute for cash-grain producers while enhancing soil organic matter. A typical 2,400 head finishing barn would provide enough manure co-product to sufficiently support 192 cropland acres. At current budgeted fertilizer costs, that is the equivalent of $24,000 per facility. Nebraska has a rich heritage built on the foundation of hard work, innovation, family values and agriculture. Being known as the “The Cornhuskers” proudly represents the importance of agriculture in our state. We believe we can grow pig numbers, making Nebraska a premier environment for highly competitive pork production! We are committed to increasing the utilization of Nebraska’s resources of corn and soybeans, while improving soil fertility and providing economic benefits to farmers and local communities across Nebraska. Read the details of a pork production scenario that works well in Nebraska.